Somebody seems to have re-discovered the carbon cycle, and true to form the BBC is keen to spread the word by trying to relate it to buses and jumbo jets. 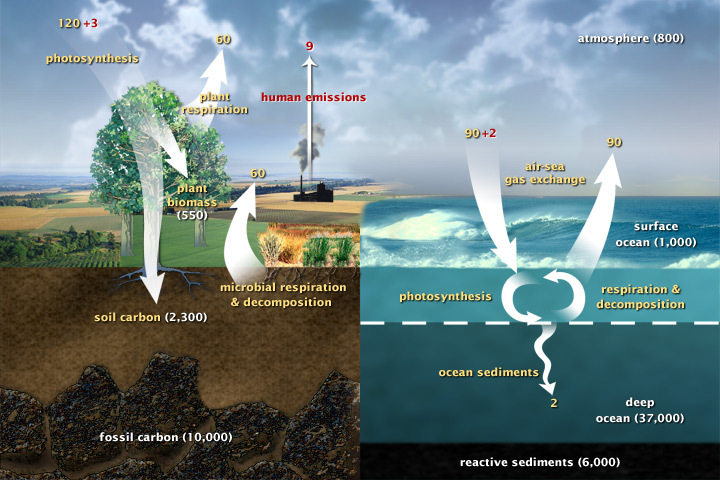 The amount of carbon dioxide absorbed by seawater acts as a moderator in the climate system. It is estimated that a third of all human-produced CO2 emissions, from fossil fuel burning and the like, ends up in the oceans. Another third is taken up by land “sinks”, with the rest remaining in the atmosphere. Researchers are keen to understand how this budget might change over time. Where are the figures for the movement of CO2 out of the oceans? “How Northern European waters soak up carbon dioxide” by the application of malt extract, malted barley, hops, yeast, and a little patience? Oh no, CO2 is polluting the oceans as well. Quick, we will have to impose a seawater rectification tax. I’ve often speculated that cold polar rain ought to act as a counter current stripper sort of thing for CO2. Cold raindrops ought to saturate with the stuff, then deposit it in the ocean. At the equator, it ought to outgas with evaporation. As the poles cool in this down cycle, that would argue a shift in the mass balance toward less buildup in the air, and maybe even a decline. I tend to agree with E.M.Smith. Another point: the air over my garden right now is +3C, 276K, the carbon dioxide in that air will be very close to that temperature via kinetic collisions. If the CO2 was much colder it would fall out of the air, so just how in the name of all that is holy can CO2 ABSORB any radiation from the surface in the 13 to 17 micron bands (some 20% of all the energy leaving the surface) when the peak temperature for 13 microns is about -50C, 223K? ? ? ? ? Richard: this seems to support your argument – ‘IR Expert Speaks Out’. I don’t watch the BBC as it is one of the most biased and politically one-sided media outlets in the world. And indeed, the few times I do now get to hear snippets of what they broadcast, the more I realise just how much of their bias I used to accept as the “normal views” of society. Instead they are just the very narrow views of the “establishment” – the political establishment in London, the academic establishment in Universities and the PC-establishment in the (once) mainstream media. Thanks oldbrew, will pass that link around. Another point I like to make is that CO2 only absorbs over the 2.7 and 4.3 micron bands when the sun is shining. That absorbed energy doesn’t reach the ground. A cooling effect! “as the POLES cool”… (typing on a pad pseudo keyboard is a pain). I think the 800 years involves the pole to equator deep water transport time. An oscillator with a very large time constant delay line. Yep. BBC World Service was all I could get in Singapore back in the 1960’s. Was considered a lifeline then. BBC here in the UK now is a total disgrace. They can’t even get the weather reports right. Given how large a CO2 sink that the north Atlantic is, its CO2 uptake is considerably reduced during a warm AMO, and the warm AMO causes further reduction in land CO2 uptake because of the drying effects of a warm AMO. That could explain the peaks in chemical measurements of CO2 in the 1940’s.